Art, Port & Cheese evening Friday 17th July 6-9pm. 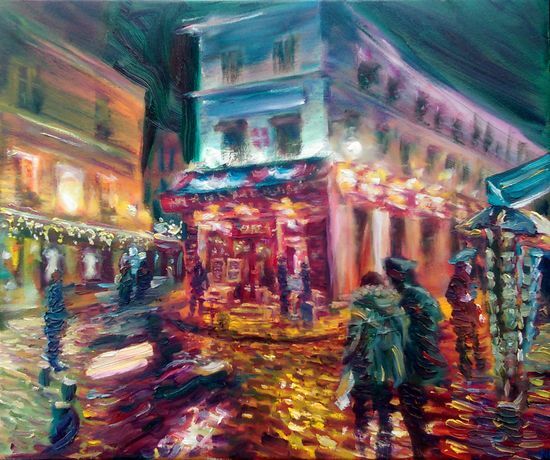 Walking through cities, Nick looks for stories to embellish into contemporary impressionist paintings. Using weather, light and reflection to add narrative to a moment in time, this Art exhibition features the cities of Bristol, Bath, London, The Cotswolds and Paris. Nick makes us want to listen in on the quiet conversation between the couple in a busy cafe; we hear the rain beating down on the umbrellas as they hurry home through the cobbled streets. He finds the best narrative comes from creating panoramic scenes, where he skews the perspective to create an added sense of movement. Blending ghostly images in the ever changing landscape of a busy city street, he summons past moods and lost emotions occurring across time.